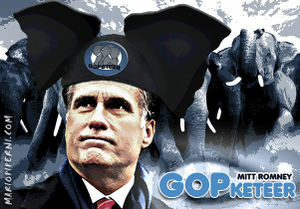 Clear evidence of Romney's collusion with the Mormon Mafia in support of mouseketeering. Mouseketeering, a crime similar to racketeering, but involving mice and the Mormon Mafia (or the Clean-cut Family), is not technically illegal yet, but it is expected that Congress and the President will pass federal statutes to banning the practice in the United States and it's territories. Longtime Don of the "Clean-cut Family" Mitt Romney began the practice in his garage in upstate Michigan, while his daddy was the state Governor. Using small animals and Satanic symbols, the young boy blindly clawed his way into that against which any conception of Hell pales... under the thrall of the Old Ones. This page was last edited on 18 Farbleum 2014, at 11:43.